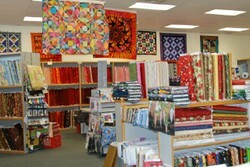 QuiltingTalk: Seminole Sampler quilt shop in Catonsville, Md. Seminole Sampler quilt shop in Catonsville, Md. Seminole Sampler, 15 minutes from downtown Baltimore, is a bright and cheerful quilt shop chocked full of patterns books,notions, and of course fabric fabric and more fabric bolts plus tons of FQ's. This shop has the largest selection of batik fabric I have seen. Many quilt samples hung around the shop and suspended from the ceiling. I asked owner Linda Hampton Schiffer a pattern question and she pulled out a pencil and sketched out several ideas for me! It's a shame you don't have a donate button! I'd without a doubt donate to this outstanding blog! I suppose for now i'll settle for bookmarking and adding your RSS feed to my Gooogle account. I look forward to fresh updates and will talk about this website with my Facebook group. Talk soon! Hi thedre i am kavin, its myy first time too commenting anyplace, when i read this article i thought i could also make comment due to this brilliant piece of writing. Hi there, just became aware of your blog through Google, and found that it's truly informative. I'm ggoing to watch out foor brussels. I'll appreciate if you continue this in future. Numerous people will be benefited from your writing. Cheers! Wonderful website you hace here but I waas wondering if you kbew of any discussion boards that cover tthe same topics discussed here? I'd really love to be a part of group where I can get responses from other knowledgeable individuals that share the same interest. If you have any recommendations, please let me know. Many thanks! Hi there, I found your wesite viia Google whilst looking for a comparable subject, your site got here up, it appears to be like good. I have bookmarked it in my google bookmarks. Hi there, simply cganged into aware of your weblog through Google, and located that it's really informative. I am gonna be careful for brussels. I'll appreciate if you happen to continue this iin future. Maany ppeople will be benefited out of your writing. Cheers! Amazing! Its truly amazing article, I have got much clear idea onn the topic off from this piece of writing.